Aubrey | Pump That Pedal - We've got it, You want it, Come and get it. Worst Car Trouble Experience: Blew a head gasket and my old Dodge Ram was a pain to start in the morning! Be sure to go check her out at her own site, Aubrey Ambrosia’s Awesome Adventures! She couldn’t get her car started and called you to see if you could stop by and help her out. The video starts with you walking down her driveway where she meets you. Dressed in some cute little suede boots, a short dress, warm coat and leather gloves, she eagerly…. None of the cars enjoy the cold, damp weather but I think the Bug is the worst of them all. Aubrey wants to try and get it running and after a lot of pumping, sputtering and coughing, the engine finally roars to life! Aubrey revs it up for a few…. The Coronet isn’t a big fan of rainy days. Aubrey uncovers the car just enough so she can get in it. She then starts working the process to get it started. The car sputters at first and then fires up but when she’s seeing if it’ll idle on it’s own,…. The car is started and she takes us for a drive in the old Monte. After driving for a bit, she puts her right boot back on and slips off her jacket to reveal a low-cut tank top underneath. As we drive back, she sings a bit while we watch…. This is the first clip we ever filmed of Aubrey. She’s wearing some snakeskin print stiletto boots as she cranks the Monte Carlo. She’s had some issues with starting cars and it shows in this clip. When the car doesn’t start up right away, she searches for her cigarettes and…. Aubrey starts out playfully revving the Coronet. She has on a country girl outfit with some bright pink stiletto pumps. She gets more and more into her revving as the video progresses. You get to see both her face, body and feet partway into the clip with a picture-in-picture setup. …. Aubrey knows she’s going to have a battle with the Volvo on this damp day. 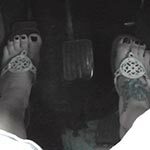 She’s wearing some thong, flat sandals as she scurries to the Volvo, gets in and begins the process of pumping the gas pedal, using the choke and hoping for a bit of luck to get…. Aubrey has to get to work but her car won’t start! She smokes a cigarette to calm her nerves and even pops the hood to see if she tell what is wrong with it. Frustrated, she keeps trying but she eventually has to call for a ride to work. Aubrey needs some help starting the car, which she’s sure you won’t mind offering it. She cranks the old Coronet, pumping the gas and keeps asking you what she should do. Should she pump it slower? Faster? She teases you with her short dress, tall boots and dark pantyhose you…. Aubrey hops in the Volvo and takes a bit to get it started. She pumps for a while in her red peep toe stiletto shoes but figures she might have better luck with her bare feet. She takes them off, starts pumping and sure enough, the Volvo starts! She revs….